36 people died in the California warehouse party fire. Askew was a guitarist for the band Them Are Us Too. Their website describes their music as "lo-fi bedroom pop." The group was founded by Kennedy Ashlyn, a Santa Cruz native, and Askew joined after seeing Ashlyn perform, according to the website. The band's debut album, Remain, was released last year by Dais Records. "Cash Askew was an absolutely loved and treasured member of the Dais Records family," the label said in a press release, according to Pitchfork. "We were in awe of her talent, her gentle kindness, and her creative momentum... her passing is an excruciating loss that we may never fully process or recover from." The band's previous tourmates, Wax Idols, shared a tribute to Askew on Instagram. "Cash Askew, we love you so much," the post said. "Getting to become close with you on tour & watch you perform every night for a month was a privilege and a revelation. You were as iconic as you were pure. You're stardust now, bunny. See you in our dreams." "We just received word that my brother David Cline passed away in the Oakland fire. To all of you, thank you. Thank you for your kindness, help and love. To David, we love you. You will be with us always." Gomez-Hall was an administrative assistant at Counterpoint Press, a publishing house located in West Berkeley. 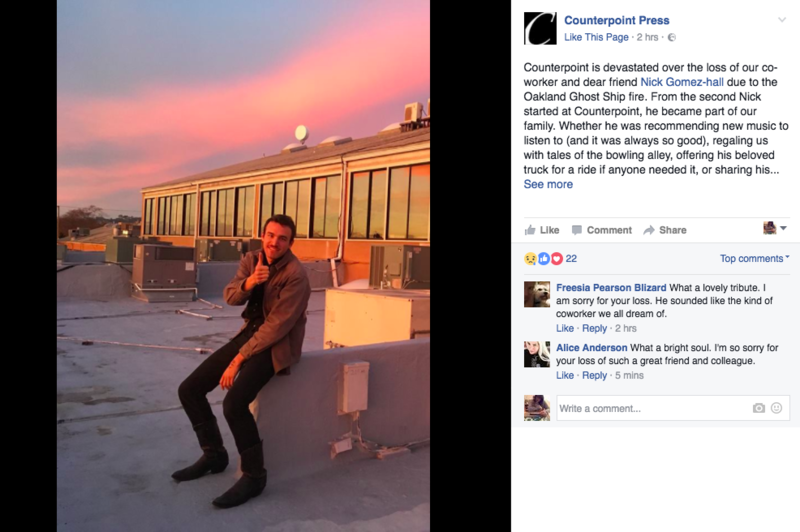 Counterpoint is devastated over the loss of our co-worker and dear friend Nick Gomez-Hall due to the Oakland Ghost Ship fire. From the second Nick started at Counterpoint, he became part of our family. Whether he was recommending new music to listen to (and it was always so good), regaling us with tales of the bowling alley, offering his beloved truck for a ride if anyone needed it, or sharing his much appreciated opinions about a book jacket or manuscript, he made everyone feel like they were his friend. He was kind, considerate, hilarious... In short, he was an essential part of our team. We send all of our love to Nick's family and friends and hold our treasured memories of him deep in our hearts. Counterpoint mourns the loss of an extraordinary co-worker and a true friend. Rest in peace, dear Nick. Gomez-Hall appeared passionate about photography and shared his photos on a Tumblr website. Friends of his also posted touching messages to him on Facebook. Brittany Barraza wrote: "Almost 15 years of love and friendship. What an incredible gift to grow up next to a kid like you, Nick; and what an even greater gift to have carried such a special friendship into adulthood. I hope you knew how loved you were and I hope that you Rest In Peace. 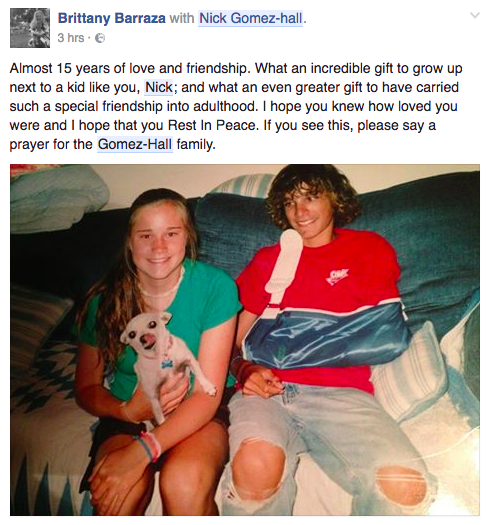 If you see this, please say a prayer for the Gomez-Hall family." Hoda was a teacher at a Montessori school. Her former housemate Carol Crewdson posted a tribute to her on Facebook when her death was confirmed. My old housemate Sara Hoda has been identified through fingerprints at the Oakland Ghostship fire. I kept hoping that if I posted people would tell me she emerged unscathed but as more information rolls in that doesn't seem to be the case. She confirmed that she was going to the party at 10:24pm, and her truck was found parked outside the venue. "Sara was a principled person, she was compassionate, decent, and honorable. She didn't do drugs and she wasn't a drinker. She was a teacher and a gardener, working at a Montessori school. She was a good, hard-working person, she loved children and the earth, and she put those principles into actions. She didn't deserve to go like that. After reading an account of what it was like to get out of there, all I can hope is that it happened quickly. Hough was a member of the electronic band Ghost of Lightning with friend Mathew Zipkin. His father, Brian, shared a photo of the pair of them on Facebook, and many friends and family shared memories of Hough. Jeanne Geiger wrote: "Offering my condolences. Travis Hough was such a special member of our unique little Benicia music community from back in the days of high school.. all of us from those days are feeling so heartbroken over this and remembering Travis fondly. Sending prayers and love to you and the rest of the family. May his spirit rest in peace. ❤"
James Morgan added: "To me, Travis was always a model of compassion and grace. I have a profound admiration for him and the way he lived. He was a free spirit. He will be grievously missed. My heart is with you. I can't imagine." Kellogg worked at Highwire Coffee Roasters in Berkeley. The coffee company closed for the day as it awaited news following the fire. "Having received confirmation that at least one of our missing is among the deceased, we ask the media to respect the very difficult process of absorbing the horror of what has happened and let us grieve," the shop posted on its Facebook page. "We are dealing with this on a strictly human level at the moment, and questions pertaining to donations and other responses are difficult and premature to those of us missing our friends/colleagues. Thank you to all who have showed love and support during this terrible time." According to SF Gate, Kellogg was a graduate of San Francisco State University and was studying for a culinary arts degree at Oakland's Laney College. Kellogg was a former resident of Chico who graduated from Chico High. One friend described her as a freewheeling, free-spirited, candid person. Wittenauer, who went by the name Nex Iuguolo, was a singer with the band Symbiotix.Fungi. He posted a lot of his music on his Soundcloud account. This has been the most terrible and difficult weekend I've ever lived through in Oakland. I'm very grateful for all the beautiful things these lost souls did to make this world more expressive. I'm so sad that I won't see Chase/ Nex Iuguolo at the next music party or art opening. He was the nicest man in this city and I was always so happy when he was there. He was the living embodiment of ambition, and community, and kindness. He was so passionate about his music and his projects and wanted everyone to feel the joy he did in doing their life's work. Always so optimistic and curious to hear whatever work you wanted to do or were doing, eager to help out. He never judged you for where you were on the path of your dreams so long as you were there. There just aren't enough people like him. Friends of Ara Jo said she was a vibrant artist, who made friends with everyone she met. “She was a very, very social girl,” Han Park, Jo’s uncle, said to the San Francisco Chronicle. Park had come in from from Los Angeles, where Jo grew up. She was living in Oakland, the Associated Press reported. Her parents flew in from South Korea. "She's a typical artist. She's got more causes than she has energy, even though she has a lot of energy," her boyfriend, Terry Ewing, told the AP. Ewing said she was passionate about Native American rights and the Dakota Access Pipeline in North Dakota. "Ara Jo is the heart of Oakland," friend and fellow artist Stephanie Sarley wrote in a tribute on Facebook. "She was an amazing artist, community leader and one of the best people to be around." Shazam confirmed that one of their employees, Kioymi Tanouye, had died in the Oakland fire. "The Shazam family is mourning the loss of our amazing Kiyomi Tanouye," the company said on Twitter. "We love you and will never forget you Kiyomi." The Oakland music store Issues also said they were mourning the loss of "our bright shining star" when describing Tanouye who volunteered at the store. Noella Teele, co-owner of Issues, described Tanouye on Facebook as "loving, caring, compassionate, selfless" and said she was always there "for anything." "I remember Jennie at Issues as a very nice and kind person who was very knowledgable about music periodicals and also played the most interesting music that made coming to the shop enjoyable," Michael Dickens wrote on Facebook. The San Francisco Chronicle reported Tanouye was operating her side business called Underground Nail Bar, where she would do manicures at parties, when she died. Bohlka was a poet, who also worked as a barista and baker, and was described by her former partner as "the best person in the world," SF Gate reported. "Em was the most caring, compassionate person I've ever met," Natalie Jahanbani, who was her partner for seven years, told SF Gate. "The most infectious, funny sweet person." Bohlka grew up in Claremont, earned a bachelor's degree in English from UC Riverside, and a master's degree in literature from Cal Poly Pomona. Bohlka worked at Highwire Coffee Roasters, alongside Donna Kellogg who also died in the fire. It is believed the pair attended the music show together. I am devastated that my child is one of the victims in the Oakland fire. Many of you will remember her as Matt. But recently she was transitioning to become a beautiful, happy woman. She took the name Em. I just wish with all my heart that she had more time to live her life as she truly wanted. My heart goes out to the entire trans community who feel as if they must gather in unsafe buildings to experience their community and celebrate their identity. Our communities must become more open and accepting of all people, all identities, so that everyone can enjoy a great party or concert in a space that is not a death trap. Pines was a new arrival to Oakland and was close friends with musician Cash Askew, who also died in the tragedy. Feral Pines you went through a lot of changes as we all do. You were always one of the most genuine human beings I ever knew. You showed me punk music and we made loud and often incoherent punk and metal music out of your garage for years. You were with me when I got my Dave Rave nickname and you knew I always had your back. Thank you for always having mine even when we didn't see each other for long periods of time. Her family said Pines, a transgender woman, also chose the name Riley Fritz. Ghassan was a film director who split his time between New York and California. He was a father to two young girls. "We don't know anything. We're all prayerful. We're waiting for answers, we have no answers," Ghassan's mother Emilie Grandchamps told NBC 4 New York before his death was confirmed. "My son is absolutely phenomenal. He's an artist at heart, a wonderful dad, a wonderful son, a wonderful friend. And we're waiting. We're waiting. We're just waiting and we're doing our best." Ghassan's fiancee Hanna Ruax attended the party with him. She also died in the fire. Ghassan posted an Instagram video from inside the warehouse dance party just an hour before the deadly fire broke out. Hanna Ruax was the fiancée of Ghassan. Originally from Helsinki, Finland, Raux had been in Oakland since November, KRON4 reported. The couple had been dating long-distance, with Ghassan planning to move to Europe. Ruax was an entrepreneur, yoga instructor, and social activist. She had helped organize a protest after a large neo-Nazi rally in Finland. "Hanna, you taught me a lot about inner peace and happiness, as a friend and yoga teacher," Mikko Kuiri wrote on Facebook in tribute. "Home is where your heart at — now you guys' hearts are as one and live together forever. One love." Gregory was at the event with her boyfriend Alex Vega. His family later said he had also died; the couple's relatives believe they were embracing each other as they were trapped in the fire. Gregory studied child development at San Francisco State and worked at Urban Outfitters, the San Francisco Chronicle reported. Gregory grew up in San Bruno, pitched for the Millbrae Girls Softball League, and attended high school in South San Francisco, where her family still lives. Alex Vega attended the event with his girlfriend; he loved music, family members and friends said. After being missing for days, his brother on Tuesday said Vega had been identified as one of the victims. Vega graduated from Capuchino High School and went to work, the East Bay Times reported. He most recently worked at a mortuary, assisting families, the Times reported. Lapine graduated from The Evergreen State College in Olympia in 2008. 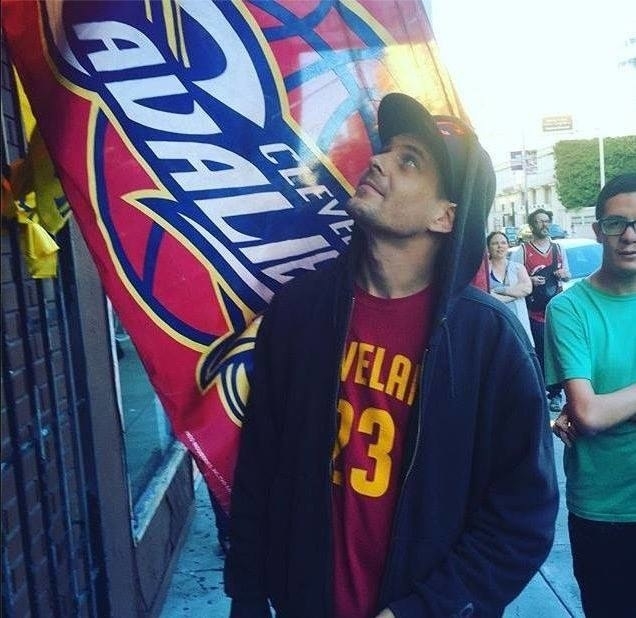 "Edmond Lapine lost his life in the Oakland fire on Friday. After a weekend of texting, calling, and crying, all of our worst fears have been confirmed. I spent tonight talking about Edmond with a longtime friend who introduced us. I can't imagine that the boyfriend who helped me buzz my head when I was 20 because "that patriarchy got you down girl", who came to my families Thanksgivings, who introduced me to about half of the music I listened to.....and all of the British television, who became a close and valued friend after we parted ways romantically...is just gone. While we always stayed close, I feel really lucky that he and I both lived in Olympia for about a year before he moved to Oakland when I had returned to finish school. That he met and loved my partner and I met and love his. I feel really lucky that I was able to see him this summer and talk to him a few weeks ago. Thank you for all the love and calls. I can't get myself to respond to most right now but I see them and appreciate it. Hold the ones you love close. If you would have asked me a week ago if i would have seen him again, I would have never have second guessed it. I am here for all of you. Lets not be alone in this." Morris was a student at UC Berkeley and attended the warehouse party with her roommate Vanessa Plotkin, who also died in the fire. With broken hearts, our family received the news today that our daughter Jenny Morris, who was listed as missing at the Oakland warehouse fire has been identified. This is devastating as Jenny was such a beautiful, intelligent, creative, caring and sincere young lady with a bright future ahead of her. Jenny attended a Christian church and made a confession of faith and accepted Jesus into her heart during her youth. We are confident that she is now in the presence of the Lord in heaven and we will see her again someday. We deeply appreciate the outpouring of support, prayers and love by our family and friends to us during this extremely difficult time. We’ve created a private Facebook group to show how much we all loved Jenny. Please join and post your thoughts, memories, photos and prayers there for us to remember. She has touched so many our hearts and lives - we miss and love you so much Jenny! Vanessa Plotkin, 21, Lakewood, Calif.
Plotkin studied at UC Berkeley and attended the party with her roommate Jenny Morris, who also died in the fire. Plotkin was one of four children. She was in her third year at Berkeley and was studying sociology. Runnels was an Oakland-based musician who went by the name Charlie Prowler and was in the synthpop band Introflirt. Runnels had lived in Oakland for five years, according to family members. Runnels was originally from Mariaville, NY and graduated valedictorian from Southern Vermont College with a degree in communication. "I don't know how to do this. My brother, my best friend, my advisor, my heart... the person I've seen grown up with, and seen grow in love, wisdom, light, and a healthy dose of sarcasm. The person that has helped me through EVERYTHING. We shared more than I have shared with anyone. From chopping wood, running around in the fields with Nashoba, to festivals and shows, to being sober and figuring out life. Joys and despairs. Hours long conversations on spirituality, break-ups and failures, success and new loves, and sometimes about nothing, or just ranting about how dumb things are. He is the only person in this world who knows every single thing about me. We loved all the same things, we hated all the same things. I can't imagine my life without him. However, I know EXACTLY how he wants me to live, and will hold to that fiercely. He was uncompromising in his search for life and trust in himself. He lived fully and well. He was brave. He took better care of himself and those around him than anyone I've ever met. Do the same for yourselves now. I often wondered if he was real, or just here to help guide us. He was magic. He will continue to be magic for us. He is closer now than ever before. I can assure you he was not afraid to die, and regarded it as another experience of being a spiritual being having a physical experience. He was in a wonderful place in his life. He was so happy. My heart is with all of you in Oakland, friends of his and the families of his friends who were also lost. He has touched so many, more than he probably knew. How we proceed now is his last lesson for us. Let's crush it." Runnels also hosted a show on the independent radio station 102.7 WEQX — The REAL Alternative. The station posted a message confirming Ben's passing: "Our thoughts go out to the Runnels family in Mariaville. They just found out that their son Ben (Charlie Prowler), who also hosted Jam n Toast here at the station, was among those who died in the Oakland warehouse fire. Find Jeff at any live show and he will tell you some incredible stories about Ben! Peace, love and hippiness!" Nicole Siegrist, 29, Oakland, Calif.
Siegrist, who went by the name Denalda Nicole Renae, was a musician and played with Benjamin Runnels, who also died in the fire, in the synthpop band Introflirt. Siegrist was originally from Lincoln, Nebraska, but had been living in Oakland for some time where she studied at Laney College. Laney College teacher Carol Copperud called Siegrist "one of our most promising, creative, life-affirming music students." She was in both my music classes, and I was an informal mentor to her — helping her choose a four-year college to transfer to, giving vocal and life advice. She sat at the piano in front of me in Jazz Piano, and we had many hilarious interactions, as she was never in low spirits. She was enormously talented in so many styles of music, and had recently begun both jazz and classical singing. I last saw her the night before she died, making her jazz singing debut at a semester-end performance of the Laney jazz combos. She was so excited and came over and hugged me in her exuberance. I'm so grateful for that last interaction. If the other artists and musicians who died in that dreadful fire were half as talented as she was, the arts community of Oakland has suffered an enormous creative loss. Love your children. Chelsea Faith Dolan, 33, San Francisco, Calif.
Dolan, who performed under the name Cherushii, was a well-regarded dance music producer, event promoter and radio host in San Francisco. A bio released by her family described Dolan as "a multi-instrumentalist since childhood" who "began experimenting with electronics as a teenager, which lead to playing live techno and house at underground raves in the 2000s." Chelsea is gone. This evening, Chelsea Faith Dolan was identified as one of the victims of the Oakland Warehouse Fire. Here is Chelsea's bio, but she was so much more than that. Chelsea Faith has always been an extraordinary person, full of exuberant joy. Her personality, intelligence, clothes, music, and kindness were legendary. She discovered at the age of 3 that she could pick up any musical instrument and play a tune she had heard, or the well-composed song she'd just written in her head. At age 13, she picked up a Japanese music magazine and acquired 78 pen pals, handwriting personal letters to each of them. Some of those friendships endure to this day. It was on a solo trip to Japan at age 15, that she picked up her adopted name, Cherushii. It was so much easier to pronounce than Chelsea. Her high school experience says so much about her. She didn't want the typical cookie-cutter experience, so she put together a plan to attend an alternative home-study program while attending the local community college music program and taking the bus to the SF Music Conservatory to study classical piano. She turned to electronic music when she realized it allowed her to play the complex and haunting melodies she heard in her head. What she wanted to produce was more orchestral than one instrument could provide. Composition was her speciality. Performing Live PA was her love. Chelsea Faith and Travis Hough formed the fabulously fun party band, Easy Street. Her favorite city outside of San Francisco was Berlin, and she traveled there as often as possible to perform. She has made close friends around the world and the US while on tour. Because she loved music so much, Chelsea had a radio program as DJ Cherushii at the UC Berkeley radio station, KALX. She loved doing special shows that told the history of electronic music. She had an encyclopedic knowledge of the electronic genres, as well as classical piano works. Nothing Chelsea Faith did was ordinary. She was an adventurer; she was stellar in every way, and she will always be the star of our hearts. Chelsea was just about to release a new Cherushii CD. I hope one of her producer friends will make sure that happens. Amanda Brown, co-owner of LA-based music label 100% Silk, told LA Weekly Dolan was "one of my closest friends in the world" and "a Bay Area hero for so many people in underground music." Micah Danemayer, 28, was a musician and artist. On Friday, he was performing at the warehouse when fire broke out, the San Francisco Chronicle reported. On Facebook, friends and family remembered his vibrant creativity. A private memorial was planned for Thursday. "Micah Danemayer, our beautiful mutant comrade, passed back to his original galaxy of hardware and silver glitter," an organizer said. Billy Dixon grew up in Chargin Falls, Ohio, but his musical interests eventually led him to move to Oakland. His friend, Robert St John Price, described him on Facebook as "an artistic guide" who was "absolutely brilliant." Price said Dixon was also a "disgustingly good" DJ and beat boxer, that he loved to work on computers and even built his own recording studios. "He was silly. He was open minded. He embraced possibilities," Price said. Amanda Kershaw-Allen was from Chelmsford, Massachusetts and had been living in San Francisco with her husband, Andrew Kershaw, since 2009, he told the Wicked Local. "She is a universally loved and cherished member of the Bay Area dance community," Kershaw said. She is described as a music lover, dancer, and avid photographer. "She is one of those ultra rare people that enchants everyone she meets with a shining bright personality, infectious laugh, zero pretense, and just the right amount of witty snark." Kershaw said the couple met in 2005 and married in 2007. "Her last Instagram photo was Johnny Igaz DJing, posted mere moments before the fire broke out," her husband added. Igaz also died in the fire. Igaz was a DJ, producer, and music buyer at Oakland-based Green Apple Books. In a post on Facebook, the store said their employees were "crushed by the loss of our music buyer Johnny Igaz." While Johnny had only been with us at Green Apple for a few months, one thing that we all know for certain is how we fell head over heels for Johnny in such a short time. His charisma and passions were instantly engaging, and he had a welcoming composure that made everyone feel like a friend. He told us (and his brother Paul confirmed it) that this was his dream job ... We send our love to Johnny's family, his many friends, and to the hundreds of mourning souls in the Bay Area touched by the many lives lost in this tragedy. In a Medium post, Igaz's ex-partner and friend, Hunter Leight, wrote at length about their life together. Johnny was an amazing person. So committed to love, community, positivity, and creativity. He encouraged everyone he met and he truly believed in the power of underground communities to create the realities we dream of. He touched countless peoples’ lives and his impact will not be forgotten. I am so completely gutted that he is gone. Absolutely heartbroken. And I am so, so glad that he was here, that he was who he was, and that we got to spend so much of our lives together. We grew each other up, in so many ways. To my partner, my love, my friend, my family - I love you, forever. Madden, who was originally from New Jersey, graduated from UC Berkeley in 2015. Family friend MJ Bernier posted on Facebook: "I don't know how to even begin to describe how much Griffin means to all of us and what a terribly tragedy the Ghost Ship Fire is. So many dear friends, so much beauty now lost. He is our love. I will miss him so much it's impossible to put into words. I just hope we can continue to come together now and support one another out of this dark time." Following confirmation of his death, Madden's partner, Saya Tomioka, put out a call on social media to track down a photographer who had captured a special moment between the two in 2015. "Maybe some Facebook miracle could happen....please share. This morning I remembered the first time I went to Times Square, June 16 of 2015. Griffin and I just finished watching The Book of Mormon on Broadway. I remember tears swelling my eyes because the city was so beautiful and amidst all the lights, I got to look at the brightest light of all, my sweetie. I cried, and we kissed. Some random photographer captured this very moment, this very kiss.... I never got his name, and he just simply showed us the single beautiful snap shot that he was able to capture. I've always longed to find this particular photograph and thank the photographer.... Friends, possibly with your help, I can be reunited with this photograph, this treasured memory that I'll always keep in my heart. I don't even know if it's possible, but please share this status if you think it is. I need some light right now.... I need a reminder of the brightest light of all---love. Thank you for those sending us love and prayers, I hear you and I feel you. Our community mourns. I love you, gg, my sweetie chan. Jason McCarty was an artist and musician. He was identified as one of the victims on Wednesday, confirming what his family and friends had feared for days. His girlfriend, Grace Lovio, had rushed to Oakland from Paris, where she had been studying abroad, her mother told the LA Times. "Please send love & prayers for Jason McCarty," she tweeted as she waited for news. "He's my favorite thing about the world." His brother, Matt McCarty, also shared the news on Facebook. "Our family and friends appreciate all the kind words said over the past couple of days. May Jason now Rest In Peace." The youngest victim was a high school junior at Ruth Asawa School of the Arts in San Francisco. McGill was the son of a sheriff's deputy with the Alameda County Sheriff's Office, one of the agencies that responded to the deadly fire. The teen was a singer and was an alumnus of the Pacific Boychoir. "Draven was one of the kindest and gentlest people you could hope to meet," a post on the choir's Facebook page said. "He was a humble person that brought out the good in everybody. He will be sorely missed." He continued to sometimes sing with the choir as an alum, as recently as last week, the choir said. The oldest victim of the fire, Wolfgang Renner, was described by a friend Robert Janca on Facebook as "about as free of an individual as anyone is likely to ever meet. When we were close, it was a joy to go and visit him as he was a capable host who made all of his friend's feel welcome and celebrated." Jennifer Mendiola was set to receive her doctorate from UC Merced where she was studying health psychology. Her friends described her as a great researcher who deeply cared about people. Joseph Matlock, known professionally as Joey Casio, was an electronic musician that was scheduled to play Friday night at the Ghostship. Matlock reportedly entered the building 10 minutes before the fire broke out. His friends posted tributes to him on social media including one that described him as "a beautiful alien being who tried to show us humans how we could live and create and perform in different ways. RIP, Joey." Jonathan Bernbaum, a native of Berkeley, earned his MFA from the University of Southern California’s School of Cinematic Arts in 2008, focusing on film editing. The school, which planned to hold a vigil in his honor, described him as "a talented filmmaker who most recently had been creating immersive visual experiences for concerts and festivals." Bernbaum was regarded as a creative visual projection artist — mixing lights and video projections for electronic music shows, including large tours, according to local reports. He worked for several years of work editing films, but after he became disillusioned with the corporatization of the film industry, he discovered a unique avenue for applying his film skills in the creation of multimedia video art. He toured the world with the electronic music duo Knife Party and with VSquared Labs, among others. At the time of his death, Jonathan was widely considered one of the world’s foremost artists working in his field. Jonathan was a passionate participant in the Oakland arts community, donating his visual art to countless events throughout the Bay Area and elsewhere in California. Michele Sylvan known as a free and creative soul" reportedly died beside her partner Wolfgang Renner in the fire (both pictured above). Her friend Robert Janca posted on Facebook that Renner's "wildly creative partner Michelle was a potent visionary and was always up for life's adventure. The world is a decidedly less colorful one without them. So long dear souls. "Thank you for the treasures you shared. We will see you in Valhalla and in the interim, we will celebrate your rich lives as you would undoubtedly have wanted us to." 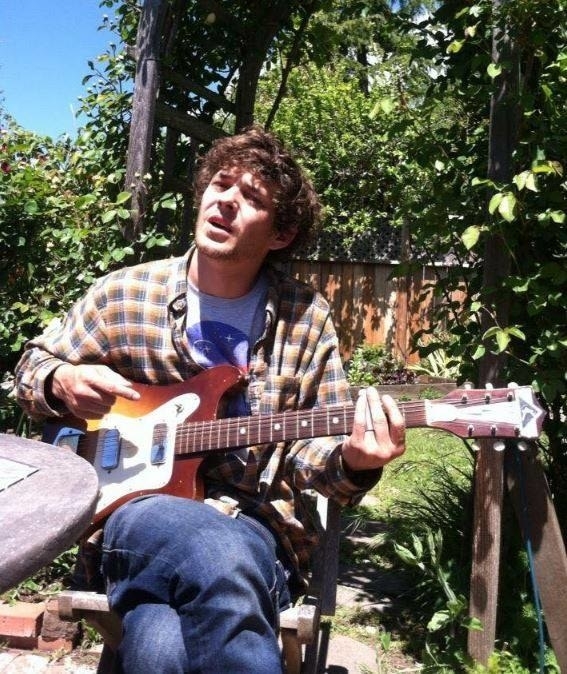 Peter Wadsworth was reportedly the only resident of the Oakland warehouse to die in the fire. He was a resident of the Ghost Ship warehouse where the fire took place. Wadsworth was an entrepreneur who was working on a cannabis salsa company and also an artist who did replicas of sculptures, according to a report in SF Gate. Wadsworth, originally from Boston, studied psychology at Harvard University and Reed College, according to reports. He had also reportedly told friends he was looking for a new place to live. Nicholas Walrath graduated as the valedictorian of Allderdice High School and was also an honored graduate of Massachusetts Institute of Technology and New York University School of Law. Walrath, a promising young lawyer, had already clerked for a federal judge and had been recently hired by the San Francisco law firm, Durie Tangri. According to his obituary, Walrath moved from New York to the Bay Area with a girlfriend, Alexis Abrams-Bourke, who said he texted her from the warehouse after the fire began to tell her that he loved her. Walrath’s goal in life was to help people, including aspirations of doing legal work for the American Civil Liberties Union, she added. Walrath had reportedly made a spontaneous decision to go to the warehouse party that night. The bike that he rode there was later found inside the burned building. David Cline was 24 years old. A previous version of this article misstated his age.